At about the same time I sent off my Oopsy Daisy Quilt I also sent off an unfinished top (UFO) to another quilter to be finished. It arrived yesterday. I was happy with the results since I basically picked out the quilting design and let the quilter pick the thread. 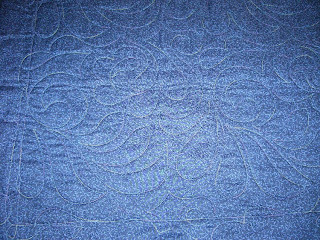 This one was in my stash just waiting for a creative idea to quilt it. They used black batting on this one so you really can't see where the edge of the quilt is in the photos. 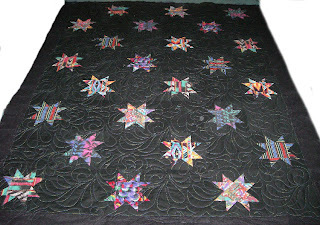 It is made out of country western shirt fabric to make the stars and random blue backing. 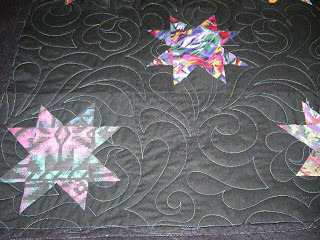 They used a variegated multicolor thread that picked up all the colors of the stars and softened the quilt top nicely. You'll probably need to click on the photo to get a better picture. It was such a beautiful day yesterday to attend the Catoctin Colorfest. It was my first time there. They were supposed to have over 350 juried artists and boy did they deliver. I think based on the pedometer yesterday registering 12,000+ steps you can guess how big it was. We ended up buying a beautiful handmade bird hotel and a of course something butterfly... A purple sun catcher. Here were two photos I wanted to share... There were from the booths in the community park. Can you imagine if you were separated from your group? Again, click on the photos to see the large view and see the people. Also, where do you park all the cars for all those people? Well, they had parking and shuttle service but a lot (including us) park on the side of the on and off rams to the two exits to Thurmont. 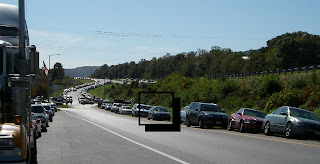 This photo does not do it justice on how many cars the eyes could see. 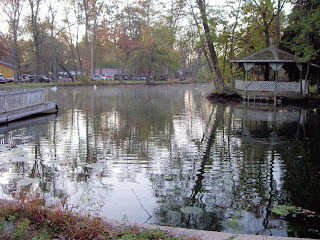 Our local fleamarket is partially house in a closed down amusement park called Williams Grove Park. It is next to the Williams Grove Speedway. 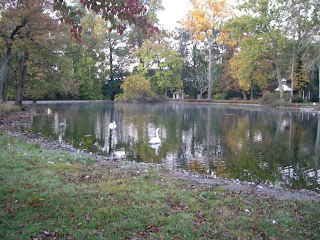 It really is a great place to walk around on a crisp fall morning. The vendors are scattered around all the abandoned rides. There is a second part to the flea marked which has the standard rows of tables. 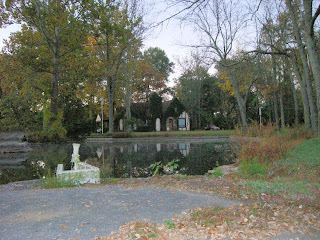 The park has several buildings and the previous owner's home is in the park as well. All this along with the swans that have chosen the park lake as their home. I just wanted to share a few scenery photos from there. I didn't want to take photos of the ride areas since vendors were already setup.